So, you open those folders with images from the wedding and start looking... for the shots that are really meaningful and show the moments of true emotion and feeling. That's the kind of photos we want in a nice collage that sort of sums up the wedding and displays what happened. It all starts a lot earlier though. It all begins with careful planning about what happens when and where I need to stand to capture the meaningful moments. I like going to the places where I'll shoot earlier and estimate what settings I could use and details. I do not like going unprepared and do make myself as familiar as possible with the conditions. Further on, I get acquainted with the itinerary and usually have it printed out for me and the second photographer so it's all clear and we do not miss a thing. Oh, yes, the second photographer is really a must when you shoot a wedding. Once-in-a-lifetime events require a trustworthy assistant. Anyway, let's skip ahead and move on to the collage. Pick the shots when something important is happening in the itinerary. Check the list and you'll see the moments. Select the photos for the collage and get creative. 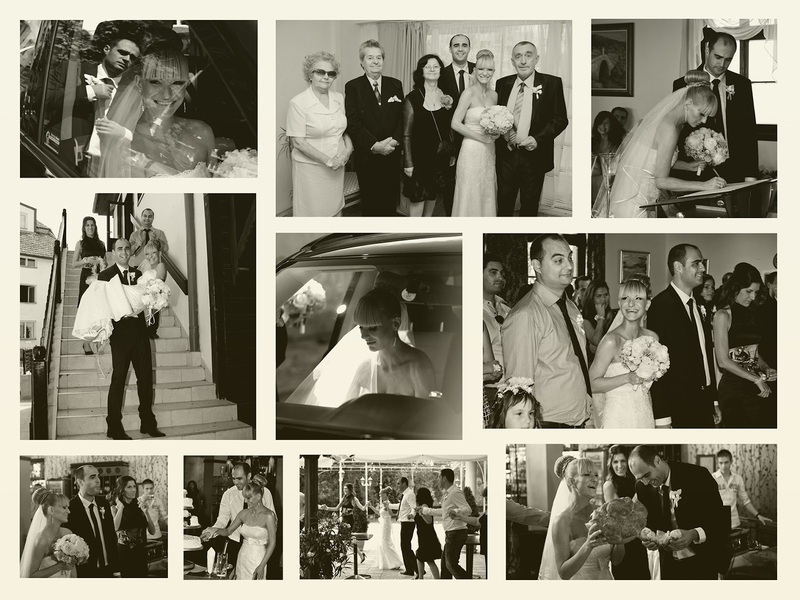 It's great to have the newly wed in all the collage shots. After all, this is what the wedding is all about. Make sure that the retouch you do is the same for all shots (I desaturate and make sure the exposure is the same to avoid big differences). Relatively chronological order is fine but not necessary. Work in layers for every photo and apply changes separately. Make the arrangements so that what you think looks better and more important takes more space on the canvas. Double-check if you haven't missed something interesting and create a couple of collages so the you family (I mean the bride) can choose from for a nice print. Do not make the pieces of the collage too small. Need more info? Comment, ask and share! Excellent wording used for your blog on the internet. I collage canvas prints from your blog very much and like your blog on the internet. To thank you.